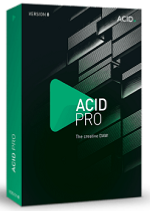 ACIDPro 8 is the creative DAW (Digital audio workstation)for every type of music producer. Behind its slick new interface lies apowerful, 64-bit music production powerhouse. It combines ACID's famouseasy-to-use workflow with pro-level features, new instruments, loops andeffects and 9 GB of brand new ACIDized loops.